Since appearing on Britain’s Got Talent in 2011 Nathan’s unique, and often tasty, artwork has become increasingly popular. 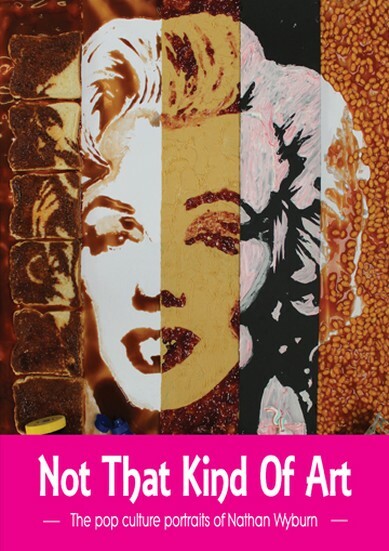 He is renowned for his original take on pop culture and has created portraits of Simon Cowell using Marmite, Stephen Fry using egg-fried rice, and even Perez Hilton using celebrity gossip magazines. This book will include photographs of his wackier pieces along with an explanation as to the thinking behind – and the work that went into – creating this very unusual kind of art. Nathan Wyburn is a young artist from South Wales who creates celebrity portraits using non-traditional mediums. He first came to public attention when he appeared on Britain's Got Talent in 2011. He reached the semi-final, and despite not winning the show, this catapulted him to success. He has since made numerous television appearances, and a number of celebrities have commissioned his work.